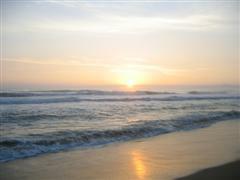 Miles of soft golden sandy beach await 100 meters from our front door. It's one of the best parts of living here. Les has been drawn to the ocean ever since he was in the navy and got saltwater in his veins. Walking the dogs, we've found many driftwood and amber treasures. It's a joy to see the dog's love of running in the sand! They can hardly contain their exuberance, playing fetch-the-coconut seed - our tropical version of a ball. 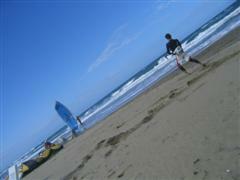 Watching the sun rise in early morning, or the kite boarders in the afternoon, the beach scene is always changing. Mother ocean takes "bites" out of the sandy shore, leaving 6'tall cliffs. Then brings it all back again, restoring the gradually sloping beach. 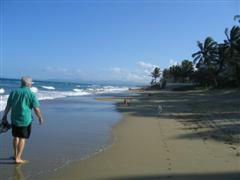 Cabarete beach in town is a 10 minute walk away. It's lined with shops offering kite boarding lessons and equipment rentals, restaurants and bars. 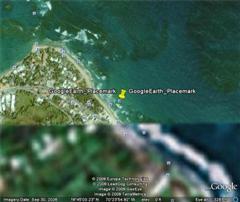 The tranquil bay gently slopes to the ocean, and is a popular place for family swimming. 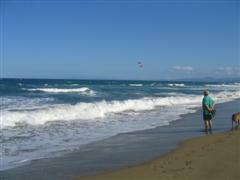 Offshore, and around the point at Encuentro Beach, large surfing waves are a favorite spot for surfers and kite boarders. You can tell a "good-wind-day," when the clear blue sky is dotted with an array of brightly colored kites, aloft over boarders skimming the waves. Wonderful sight. 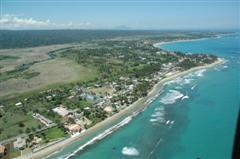 Cabarete hosts many interesting competitions. The annual sandcastle building competition brings sculptors from far and wide to show off their talents. The Master of the Ocean event at the end of February, showcases athletes competing in the windsurf, surf and kitesurfing triathlon. 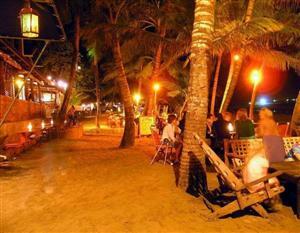 Beach restaurants and bars light up at night under starlit skies, to host the hopping night life. Our location, being 100 meters from the waters' edge, greatly reduces the corrosion and maintenance that oceanfront properties require. Our friend who lives across the street from us, right on the ocean front, has to replace a lot of his electronics every year. Our TV and appliances have lasted for over 4 years already, so that's a big saving + huge benefit. We hear the ocean surf rolling in the background, instead of the constantly loud roar that's heard directly on the beach. I prefer our side of the street where the wind is a bit quieter and dryer, and carries less salt. We really have the best of both worlds - right across the street from the beach , Vecinos is conveniently close (only 100m), but more peaceful + tranquil. Salty waterfront wind assaults have tamed into ocean breezes by the time they reach us.